SINGAPORE - Wolfing down a slice of bacon once in a while is not going to cause any lasting damage, local doctors said on Wednesday (Oct 28) in response to the World Health Organisation's (WHO) latest report that processed meats could raise the risk of colon cancer. The same goes for luncheon meat and hot dogs, according to Dr Zee Ying Kiat, a senior consultant in medical oncology at Parkway Cancer Centre. "My personal approach is that if you are the type who eats processed meats all the time, you might want to cut down," he said. "But I doubt a piece of bacon once in a while will do that much harm. Diet is only one aspect of cancer risk." On Monday, the WHO's International Agency for Research on Cancer released a report stating that there is now enough scientific evidence to conclude that eating processed meat causes colon cancer. According to the agency, each 50g portion of processed meat eaten daily increases the risk of colon cancer by 18 per cent. Red meat, such as beef, pork and lamb, was classified as "probably carcinogenic". This announcement was not surprising, pointed out Dr Raymond Ng, a senior consultant medical oncologist at the National Cancer Centre Singapore. "The information is not new as we have always acknowledged that processed food is not healthy," he said, stressing that there are several causes of cancer. Part of the reason why processed meats is believed to cause cancer is because they contain nitrates, usually used as a preservative. "We know there are carcinogens (cancer-causing substances) in preservatives," said oncologist Ang Peng Tiam, medical director of Parkway Cancer Centre. "But the real impact on cancer is questionable." In Singapore, colon cancer is the most common cancer among men, and the second-most common for women. It is also among the top three causes of cancer death for both sexes. From 2010 to last year, 9,324 new cases of colon cancer were diagnosed. The Health Promotion Board said that the average adult Singaporean consumes about 10g of processed meat a day, around the equivalent of half a hot dog. The key message, say experts, is moderation. "It is always a good idea to keep consumption of processed food to a minimum," Dr Ng said. 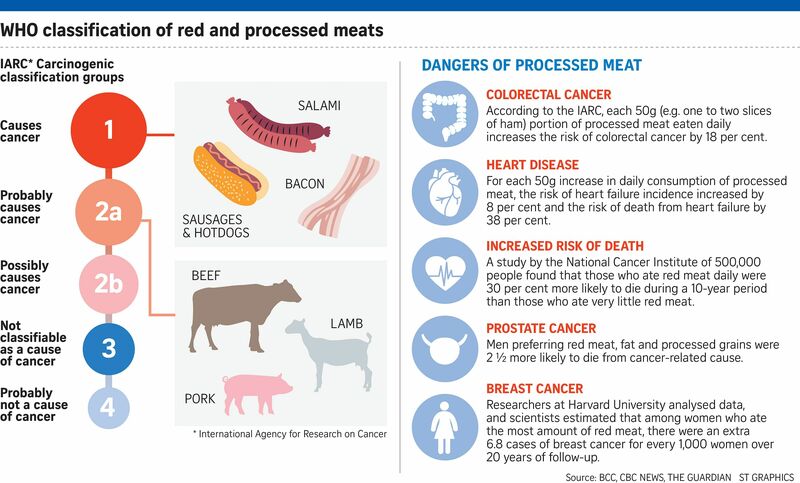 Added dietician Derrick Ong of Eat Right Nutrition Consultancy: "Processed meats are very high in sodium, and that's also been linked to a higher risk of hypertension."